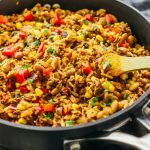 This tasty Southwest skillet has ground beef, rice, peppers, onions, pinto beans, corn, and a dash of cayenne -- all cooked together in one pan. Add rice, beef broth, and tomato puree. Stir to mix well. Bring to a boil over medium-high heat. Cover with a lid and reduce heat to medium-low. Simmer until the rice is tender and the liquid is absorbed, about 15 minutes. Remove the pan from heat. Uncover and add pinto beans and corn. Stir together and add salt to taste if needed. Optionally garnish with freshly chopped cilantro.